In Part 1 of this series on the Tempting Fate VIP movie screening in Houston on July 4th, Pedro González Arbona had performed at the pre-screening Meet and Greet, walked the red carpet and was interviewed by local media that was on site that evening. Now it was time for the main event, the screening of Tempting Fate. 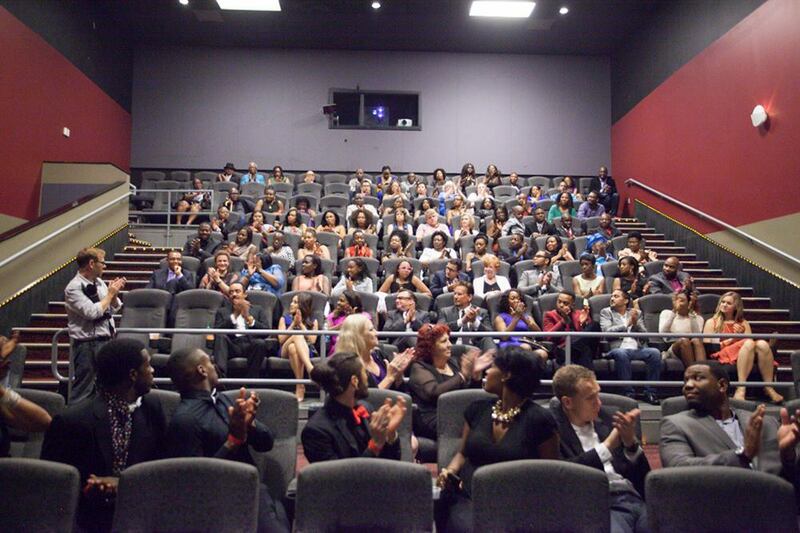 We individually filed into the theater where the screening was to be held. Our names had to be crossed off the attendee list before we were allowed to enter so there was a bit of a backup to enter the theater. Oh my aching feet…the swelling and pain in my sprained foot were making it harder and harder to patiently wait our turn to enter the theater. When we did we were directed to sit in one of the two rows of seats reserved in the center of the theater for actors and VIPs. We sat sandwiched between the actors as we waited for the start of the movie. Ramsey Nouah, winner of the 2010 African Academy Award for a lead role in Figurine, was seated to my left, and actress Trinitee Stokes on Pedro’s right. The audience, can you spot us in the crowd? Kevin Nwankwor, the producer/director/writer of Tempting Fate, was introduced and gave a few remarks to prepare us for the screening. When the movie and the music started on the full sized theater screen, I’m sure my heart must’ve skipped a beat. I knew Pedro’s music better than anyone there, except for Pedro, of course. I had been captivated by these melodies and the moods they conveyed for as long as Pedro had been composing them. They were the sounds of drama, action, brotherly love, romance, and sadness. And now here they were larger than life for all to hear. It was a strange feeling at first for me. Being so personally familiar with the music, it was hard to separate my emotion and pride for Pedro’s work from watching the movie. Initially there was a lot of chatter going on during the movie. There were cheers at times and some laughter too. At first it was a distraction for me. However, as the plot began to unfold on screen and the characters’ relationships became intertwined, I got carried away in the story. That is to say I was thoroughly engaged in the movie. I didn’t want it to end. And when it did, I wasn’t the only audience member with tears streaming down their face. Pedro’s song, “Requiem,” was playing in the background of the gripping final scene, adding impact and emotion with his music. It was simply beautiful. As the credits began to roll up the screen, the audience was clapping and cheering for the movie. Pedro’s name was one of the few with his name listed alone on the screen: Music Composed by Pedro González Arbona. Bravo Pedro!!! 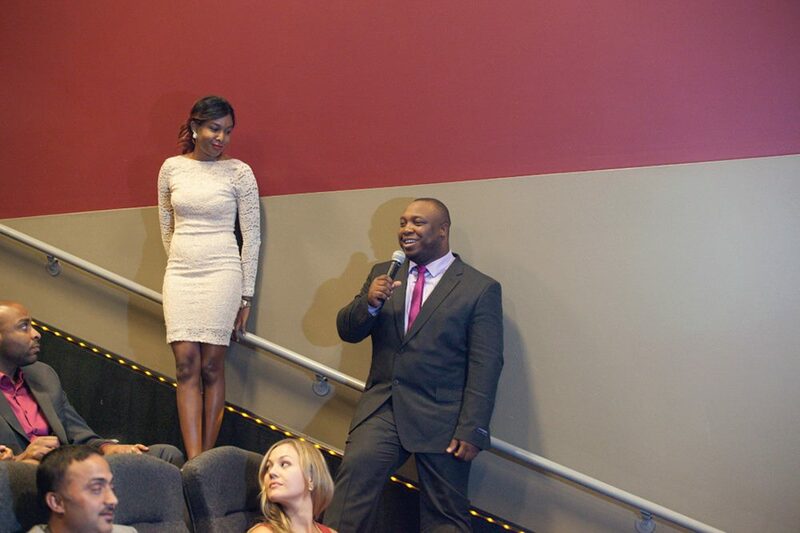 After the credits rolled off the screen and the lights came on, Kevin Nwankwor, the producer and director came to the front of the theater to address the audience. Kevin shared his passion for the project and how difficult it was to make the movie. His desire was to make it as much like a multi-million dollar movie as possible, but with the low budget that he had. And he accomplished it all in two weeks! Director Kevin Nwankwor addresses the audience. First, you don’t have a second chance in this life. Like the brothers in the movie, you don’t know what will happen in the future. You can’t do it by yourself. It is God. Do your best, work hard. But do the right thing. Whatever it is you believe that you want to achieve, I want you to know that you can always achieve it. The Tempting Fate movie has made me to understand that in this life nothing is impossible. 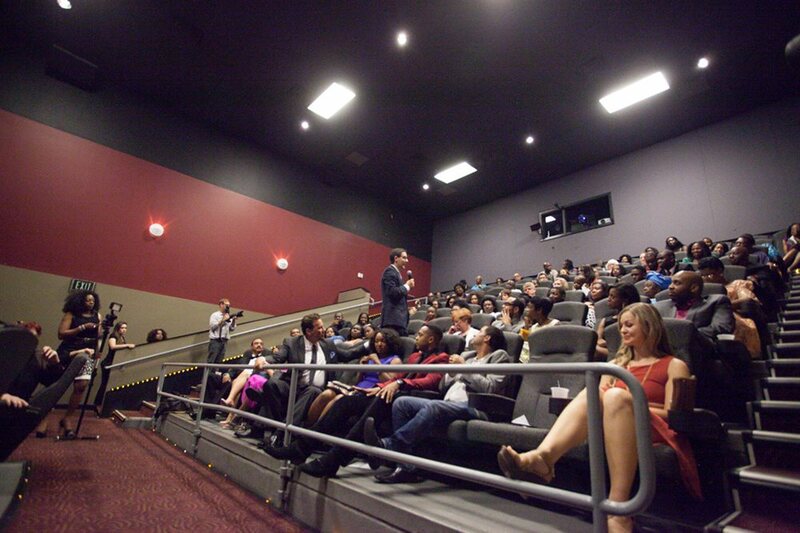 Applause filled the theater as the audience showed their appreciation and agreement with Kevin’s comments. Next on the scheduled events was an opportunity for the audience to ask questions of the cast and crew. Several of the actors were asked about how they got into character for their roles. I patiently waited and wondered if someone would ask Pedro a question; and they did. He was asked about the composing process. Pedro stood up, and was acknowledged by the audience for his music. He shared how he started by reading the script and making notes in the margin to identify scenes to add music too. Then he begins composing the music. Pedro fields a question from the audience. At the end of the Q & A session, the night was not over yet. Photographers and the press were still at the event, so the red carpet media frenzy continued longer into the night. Pedro mingled more with the actors and crew. I followed along with my camera and met people as well. An after-party was planned at Zanzibar Lounge, in downtown Houston, into the early morning hours. We graciously declined the invitation. Pedro was still dealing with jetlag and sleep-deprivation from his 2-day travel ordeal. As much as I didn’t want this night to end, I knew my feet (sprained foot) wouldn’t be able to tolerate any dancing anyway. At the end of Cinderella’s night at the ball, her carriage turned back into a pumpkin. In much the same way, our fairy tale evening didn’t have such a smooth ending either. Although the hotel was only two miles from the theater, we got lost and spent almost an hour aimlessly driving around Sugar Land, TX. Dead cell phones, no GPS, and closed services on the 4th of July all contributed to our sense of frustration and exhaustion. Thankfully we met someone in a parking lot who could direct us back to our hotel. 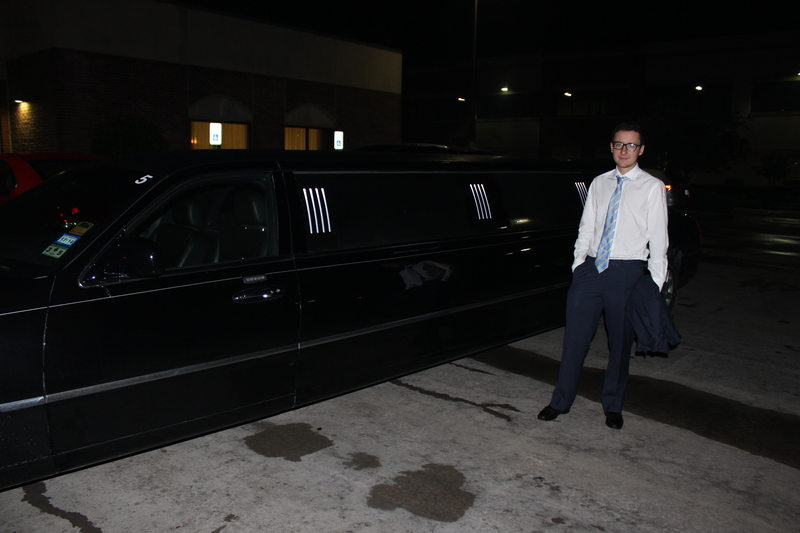 When we pulled into the hotel parking lot, the limousine was parked outside waiting to take the cast and crew to the party. Next time, I suspect that’ll be Pedro’s carriage. When the clock struck midnight on July 4th, 2014, our day to remember was emblazoned forever in our minds, not as a fairy tale, but as a dream come true—with more on the way for the cast and crew of Tempting Fate. Post Screening Update: Exciting things are definitely ahead for this movie. In the two months since the Tempting Fate screening, KevStel Group has been working on the release of the soundtrack with Pedro’s original compositions, a new music video was shot in LA for the theme song, and they announced that the movie will be widely released in Nigeria on Easter Sunday, April 5, 2015. Updated 2/12/2015: The Tempting Fate soundtrack with Pedro’s music released today and is available on Amazon and iTunes. The movie release has been rescheduled to July 17, 2015 across Nigeria.